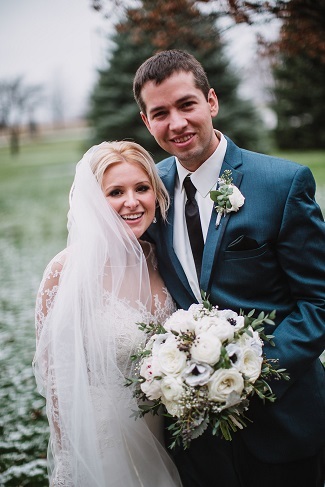 Andy and Paige were married last November in Bloomington, Illinois. 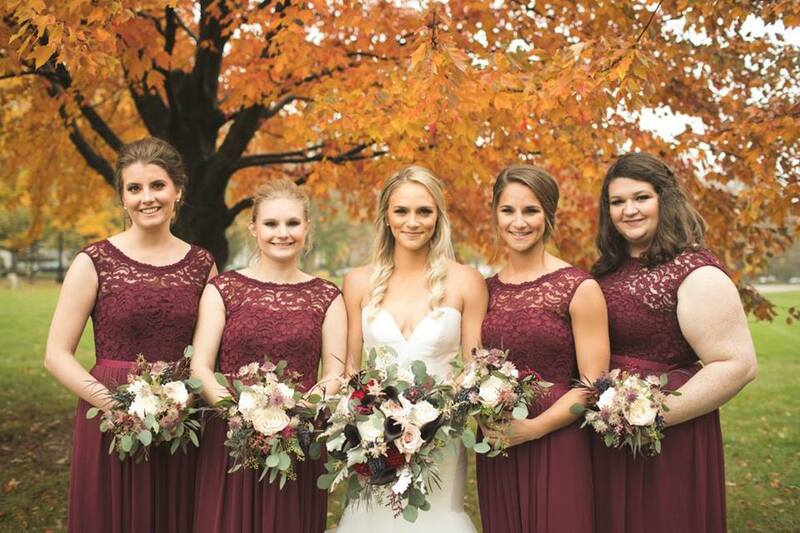 The autumn leaves were late to turn so they were still very beautiful at Miller Park Pavilion on the first weekend of November for their central Illinois wedding as revealed in these gorgeous photos by Melanie Anderson Photography. 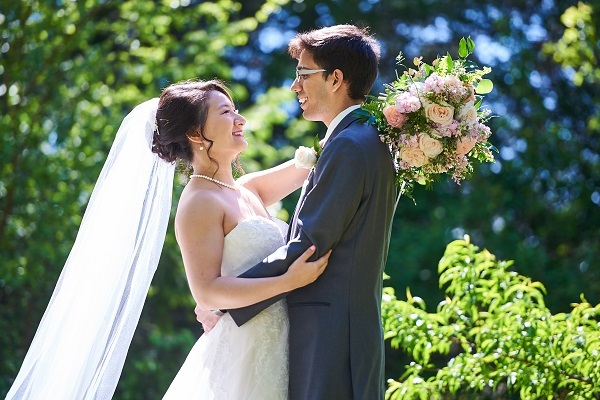 Us – Do you have a favorite memory from your wedding day? Driving up to Miller Park Pavilion and getting my first look at Andy; then watching his reaction when he first saw me! 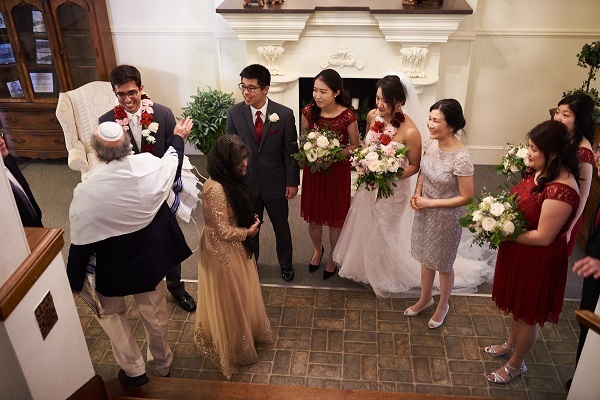 Walking down the aisle with my dad, staring at my future husband, and seeing for the first time just how many people (nearly 200) were there to share in our special day! The Maid-of-Honor (my sister) and Best Man (Andy’s brother) speeches; everyone said there were some of the best they’ve ever heard, and I agree! Dancing with friends, cousins, aunts, uncles, grandmas and grandpas – all night long! Walking through the sparkler tunnel on our way to our limo. It was the most perfect way to end the night! Us – How did Andy propose? Paige – All my family was gathered at my grandparents’ house to celebrate my grandmother’s birthday. It was an unseasonably warm and beautiful fall day and because it was so pretty and the leaves were so colorful, I asked my sister to take our photo on the dock. (I had no idea that Andy had a ring in his pocket!) She took a couple of great photos, and then Andy insisted she take one more. My sister hesitated just a bit, but as she took another photo, Andy dropped down on one knee and asked me to marry him!! I turned to my sister in shock and we both started crying. Hearing all the commotion the rest of my family came running from the house. 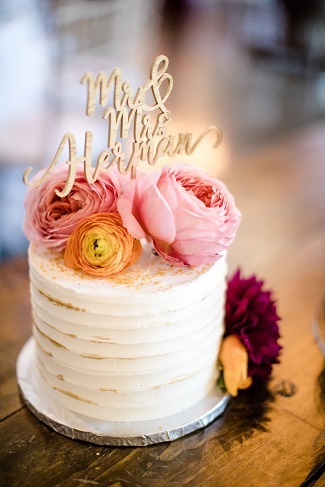 We celebrated with champagne and of course – a lot more photos! 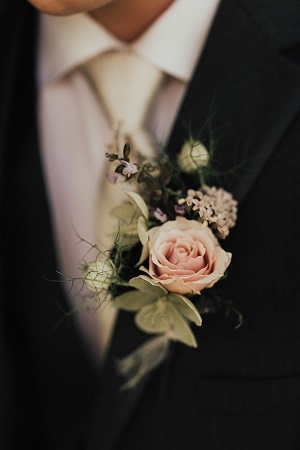 Us – Your father was very involved in planning your wedding which as you know is unusual for most bride’s fathers. 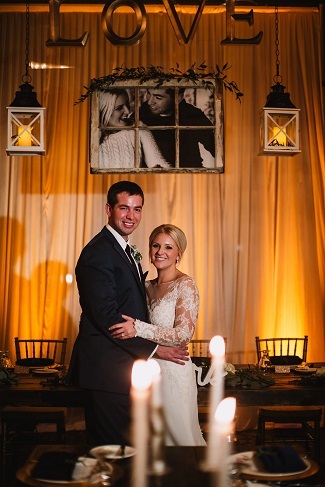 Paige – My dad is a very organized, hardworking person who loves to help others. He knows how to bring a vision to life, so Andy and I were thrilled that he wanted to help with the planning and preparation for our big day. 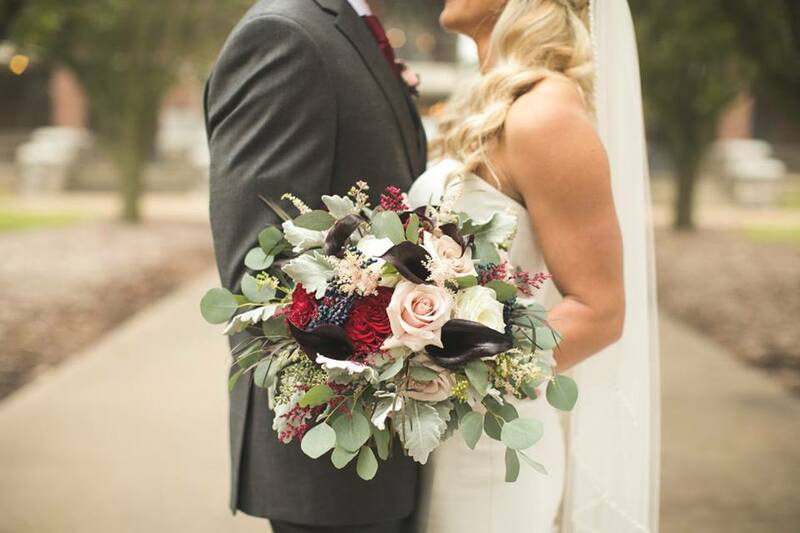 Paige’s color palette was burgundy and blush so we chose the deep red Hearts rose and black mini callas along with the beautiful blush Quicksand rose, light pink astilbe, mauve astrantia, navy privet berries and seeded eucalyptus for texture and a mix of greens/dusty miller for her bridal bouquet. 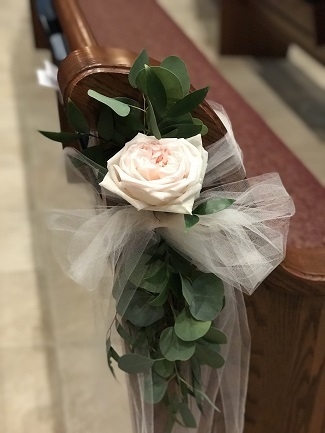 Paige’s mother surprised her and had us attach her late grandmother’s (as well as her own) wedding bands to Paige’s bouquet handle wrap. 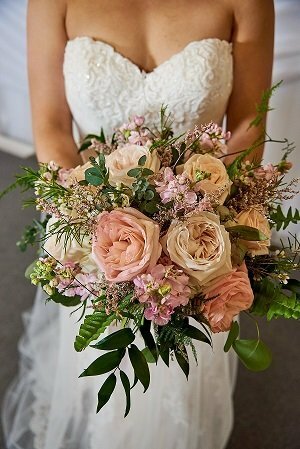 For the bridesmaid bouquets, Paige wanted mostly white, blush and mauve blooms along with the textures and greens so the bridesmaid bouquets would show up against their berry colored dresses. Us – Is there any detail that you would change if you could do it over again? 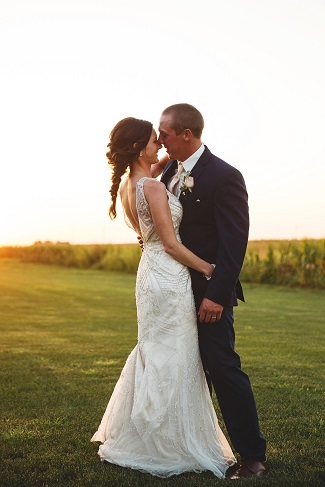 Paige – No, everything turned out better than I could have ever imagined! I would not change one detail!! 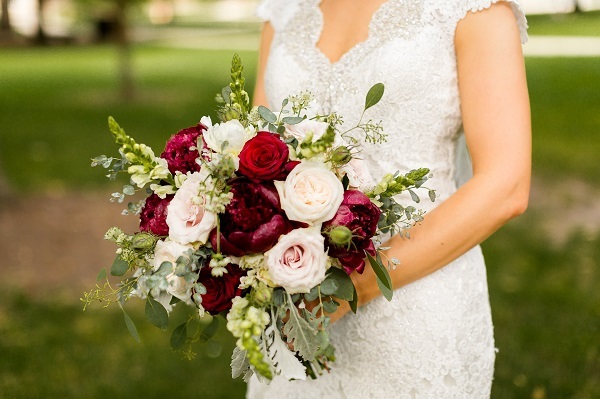 Call or text 309-212-6570, or email fancyfloralsbynancy@hotmail.com to receive your free consultation and share your floral vision for your wedding flowers. 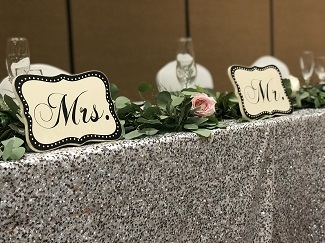 Is there anything you learned in the process that would help other couples plan an out-of-state wedding? 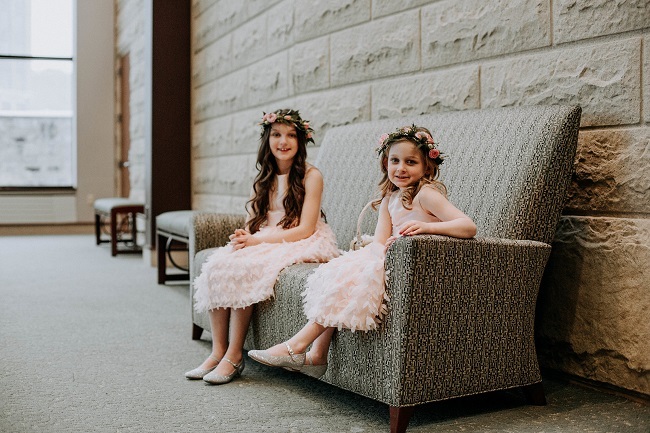 Delaney – We were lucky in that we have family who live in Champaign that we could trust with helping with tasks that we weren’t able to do ourselves from a distance. 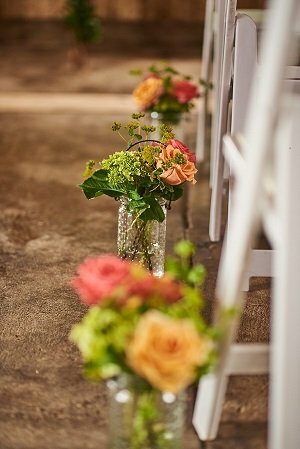 If you don’t have a trusted family member or friend who lives near where you are getting married, I would recommend hiring well reputed vendors and touching base with them frequently! Our vendors were amazing and always available by phone and email which made out-of-state planning much easier. 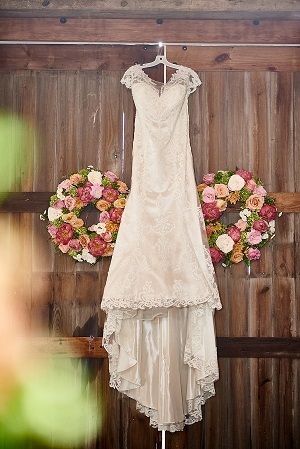 Trust your vendors -they are there to make your day beautiful and will do everything in their power to make it so!! Is there anything that you would change if you had it to do over? 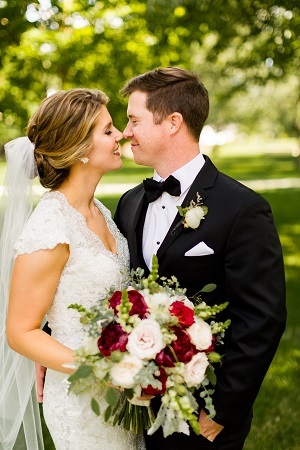 Delaney – Honestly, the only thing I think we would change would be to hire a videographer! Your wedding day FLIES by no matter how “present” you stay throughout your day. We didn’t think we had the budget, but wish we would have worked it in so that we could forever “re-live” those memories on video! 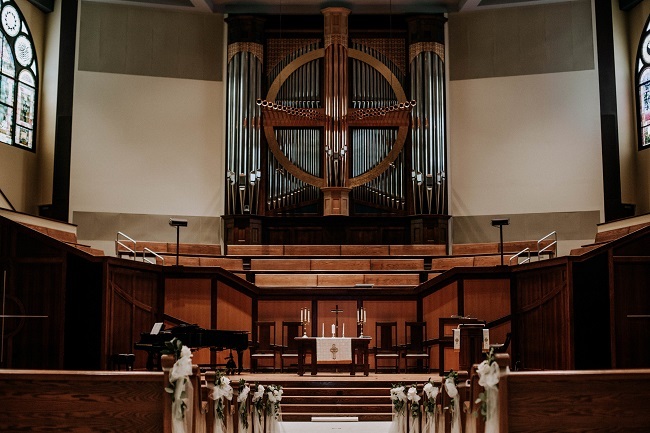 What was the most difficult part of wedding planning for you? Delaney – The most difficult for me was managing everyone’s opinions. My family was gracious enough to help us pay for the wedding so of course, they got a say! I am a people pleaser and I definitely ran into some stressful moments where our opinions differed, but I was afraid to speak up. Make sure you advocate for what you want, but also be gracious about accepting advice or opinions from people who are helping to foot the bill!!! 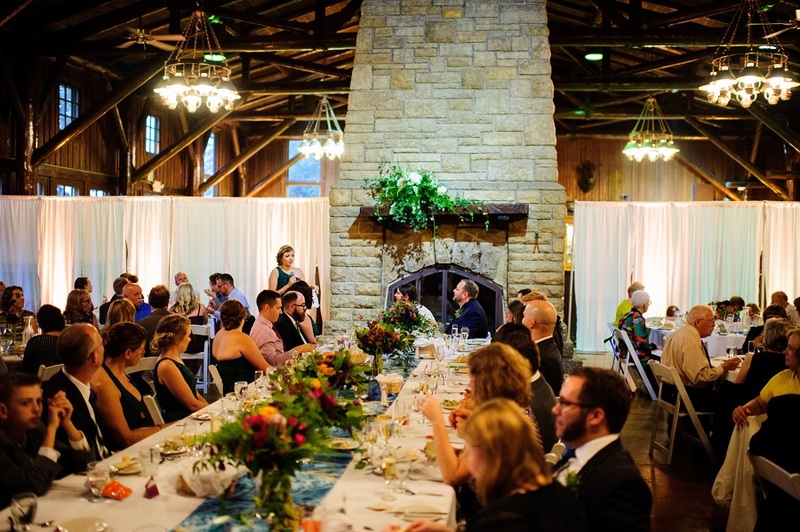 What was the most enjoyable part of wedding planning? 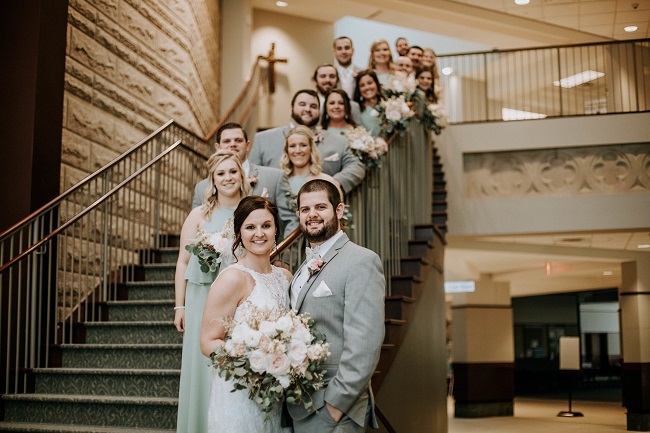 Delaney – The most enjoyable part (besides knowing I would be married to the love of my life at the end) was seeing everyone from various parts of our lives come together and form new friendships. By the end of our wedding weekend, I had friends from grad school making plans with my childhood friends to grab dinner! It made me so happy to see people from different walks of life come together like that. It just re-affirmed that I really do have the best friends ever! Do you have any words of wisdom for a newly engaged couple? Delaney – Everyone says this, but it really is true! 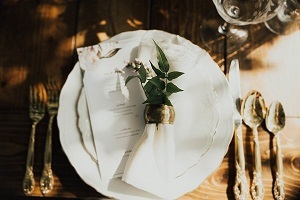 Enjoy every moment of the wedding planning process. It’s such a short period in your relationship and can get super stressful, but you are planning what will hopefully be one of the best days of your lives when your friends and family all come together to celebrate your love! It’s easy to get caught up in the small details but in the end it’s not worth too much stress. No one notices what color the napkins are – look at the big picture when you are feeling stressed. You get to spend your life with your favorite person – that’s pretty awesome!! Delaney was a joy to work with! After our initial consultation in person, we communicated mostly through email as she was in Texas and we were in Illinois. 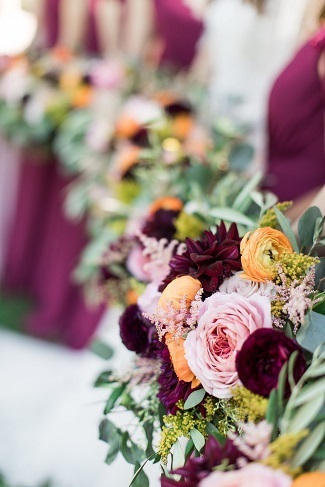 She wanted fall colored flowers to coordinate with her deep raspberry colored bridesmaid dresses, yet show up against the dresses so we pulled in pink garden roses and apricot colored ranunculus to brighten the burgundy dahlias in her bridal bouquets and reception table centerpieces. 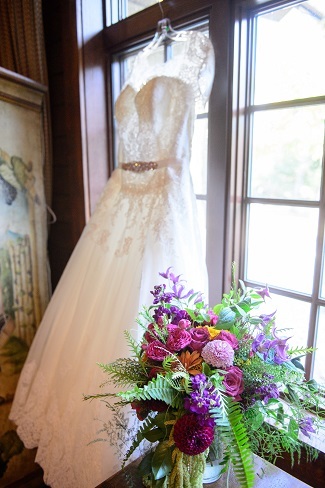 Become our next satisfied bride! Call, text (309) 212-6570 or email fancyfloralsbynancy@hotmail.com to receive your free consultation. 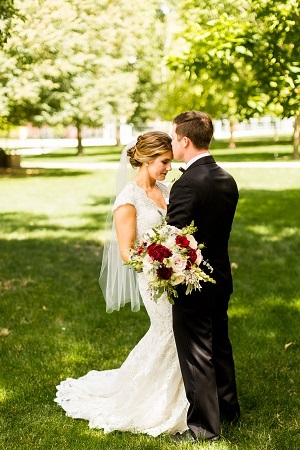 Ryan and Cara Friedman were married at Pear Tree Estate in Champaign, Illinois last September 9th. It’s always a pleasure to deliver to Pear Tree where the staff is pleasant and helpful. 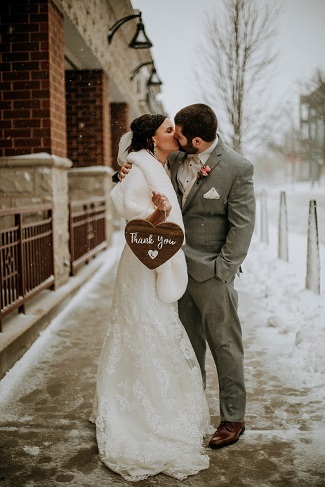 The weather was beautiful and to top it off, Ryan and Cara had booked an excellent photographer, Rachael Schirano who captured these gorgeous images of Ryan and Cara’s special day. 1. How did Ryan propose? Ryan planned a special day in Chicago for my birthday. We visited the city museums in the morning and as we were leaving, Ryan told me the next stop was really for him, a tour of Wrigley Field (he’s a huge Cubs fan). We were running a little late, and it was snowing (in April!) I was frantically rushing to find the spot where we were to meet the tour guide and trying to explain to Ryan we were going in the wrong direction. Ryan stopped at the front of the building where we first met (one of the Cubs Rooftops) and said, “there is no tour – I just wanted to bring you back to where we met and this all began!” He got down on one knee and proposed. I was so thrown off I don’t think I ever actually said yes!! 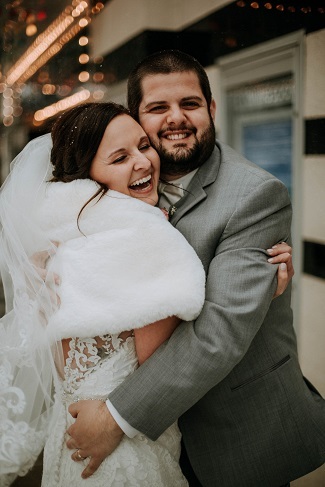 He had the rest of the evening all planned with dinner at a well-known steakhouse, meeting our parents for drinks at Harry Caray’s and then walking (in a blizzard) to the Trump Tower where we checked in and celebrated with champagne! 2. 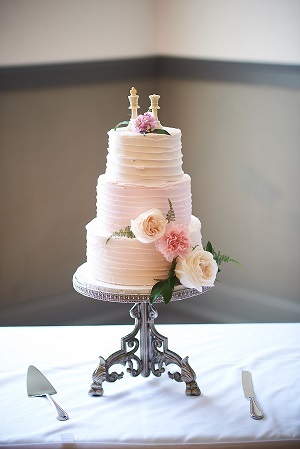 What did you enjoy most about wedding planning? As cheesy as it sounds, I really enjoyed the time bonding, not only with Ryan, but my mom and my sister! We had to make some big financial decisions together for the first time which tested the waters of how we could handle that in a marriage. Luckily we seemed to align pretty well!! As I am an indecisive person and change my mind a lot, I really appreciated my mom and sisters help in planning and depended on their opinions to help me make decisions. As I lived at home until we married, it was really nice to have the last year so close with my mom and sister who is still in high school. 3. Would you change anything if you could do it over? 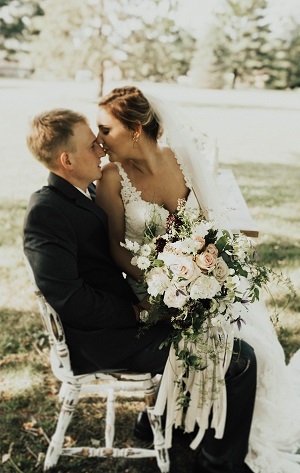 Throughout the process, there were times we would question why we were having such a big extravagant event – we really just wanted to be married!! There were times we thought, “lets just cut out all this stress, cancel the venue and go to city hall. 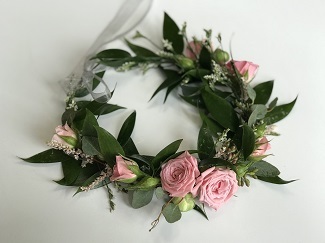 But as most girls, I had thought about my wedding day for a long time and wanted to give that day to my parents and close friends and have them there to share it with us. 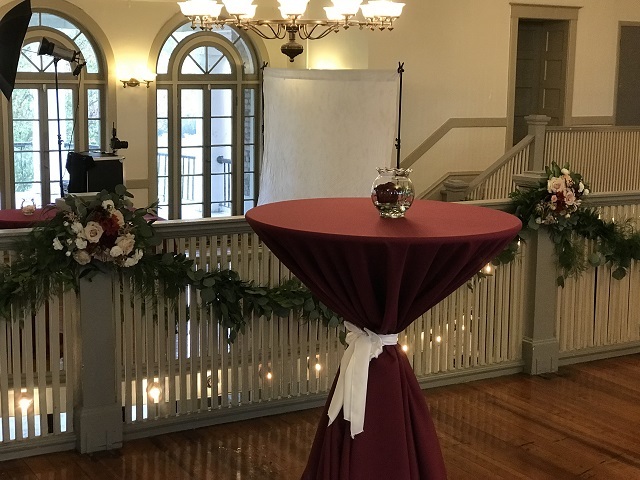 I feel like some people would say they would do without the small details, that they wouldn’t be remembered, but I wouldn’t have changed a thing – I loved all of the decor!! 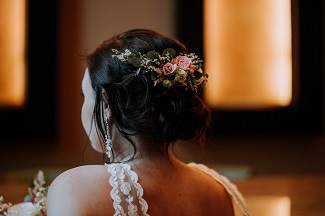 I would change my hairstyle though – I loved my “messy braid look” when it was fresh at the beginning of the day, but it fell quickly and didn’t look as it had when it was fresh! 4. How did you decide on your vendors? Deciding on vendors was a little tricky for me as neither of us was from the Champaign area. 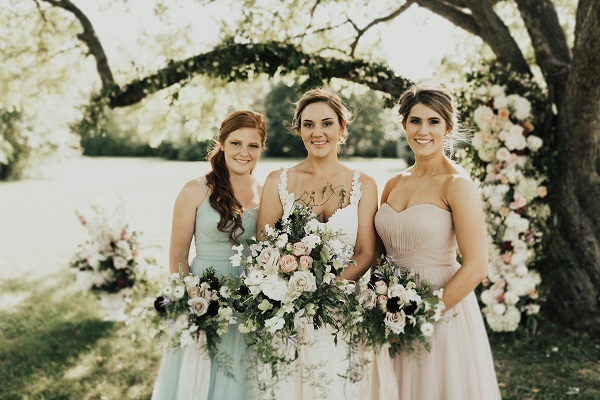 We relied heavily on online reviews from The Knot and Wedding Wire, along with personal references from friends. Since the venue was the first thing we booked, we asked the ladies at Pear Tree for recommendations. 5. 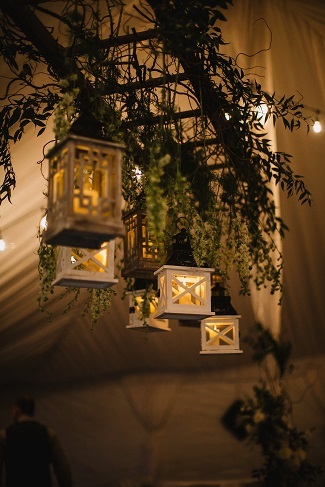 What did you find most difficult in wedding planning? Logistics! 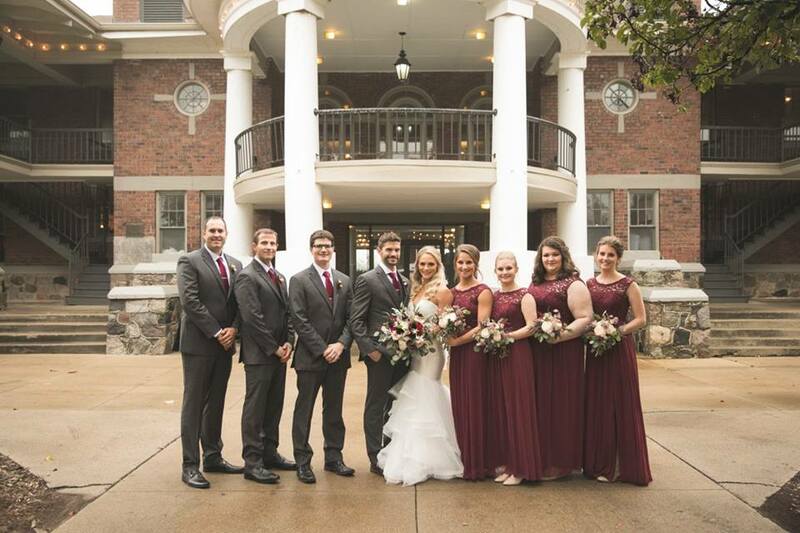 It was difficult trying to figure out rides to and from the venue/hotel for things like our first look and bridal party photos. There were times we needed cars & overnight bags at certain places, or when family needed to be there early, yet they didn’t want their cars at the venue because they wanted to take the shuttle back after the party. My recommendation is to write out a timeline so that no steps are missed!! Right after we got engaged, we took about a month to just enjoy being excited about our engagement without having the stress of starting to plan and make decisions right away. 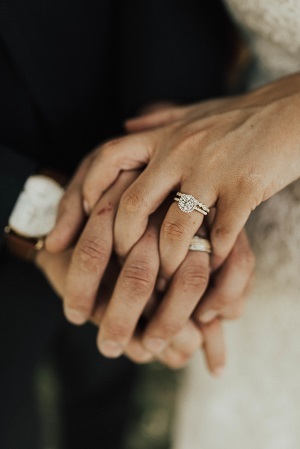 I would advise newly engaged couples to do the same – arrange for time to sit back and enjoy being engaged for a bit before starting to make plans. 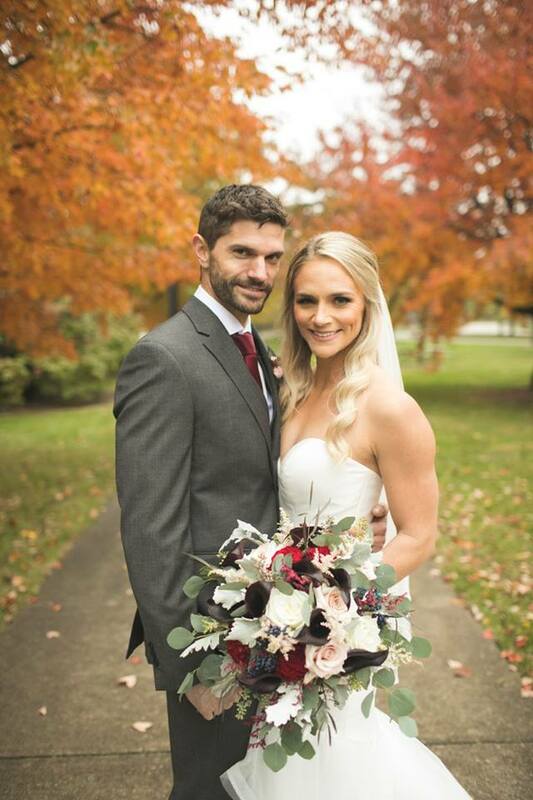 Karl and Sara’s Starved Rock Lodge wedding took place on September 16th during hurricane season. 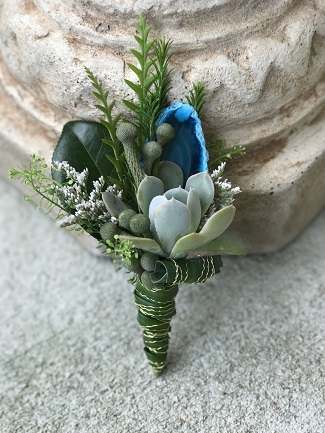 Ironically Sara works in the disaster field so when the massive Hurricane Irma shut down the flower imports in Miami, her wedding flowers that we had so carefully sourced and ordered weeks in advance couldn’t all be delivered. 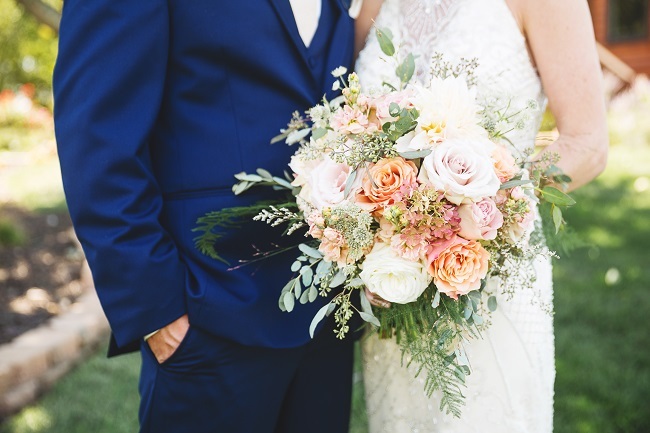 We were left scrambling to find substitute wedding flowers that were already in stock at wholesalers locally and in California. If any bride would understand this situation, it was Sara!! Bless her heart, she was working over-time right up to her wedding day helping the recent hurricane victims!! 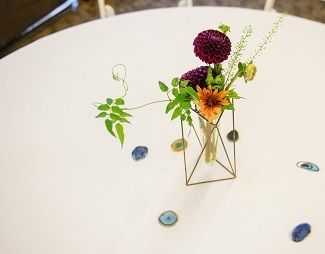 Deciding on a color palette and theme was extremely difficult for Sara, but in the end she and Karl went with their gut instincts and decided to incorporate things they enjoyed such as agates, geodes, wood and geometric containers. 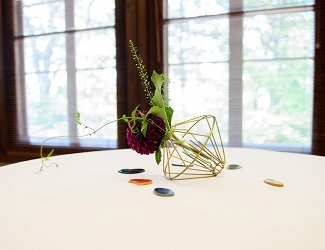 They chose colors that went well with these elements and that also felt vibrant and organic. 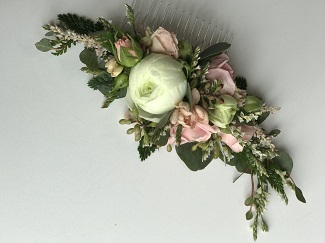 The garden roses were among the wedding flowers that didn’t arrive so we found miniature garden spray roses out of California to substitute in the wedding bouquets. As soon as we heard the hurricane could possibly affect Miami, we went to the local wholesaler and bought what they had in stock to replace the flowers that wouldn’t be able to be delivered. Karl completely surprised Sara when he proposed at the Field Museum. They were walking around when he asked if she would like to look at the Grainger Hall of Gems. As they viewed the gems and talked about which ones they thought were pretty, Karl directed Sara to a small case on the wall that contained a beautiful ring and note. It was such a beautiful and surprising moment, she actually asked Karl if it was real!! 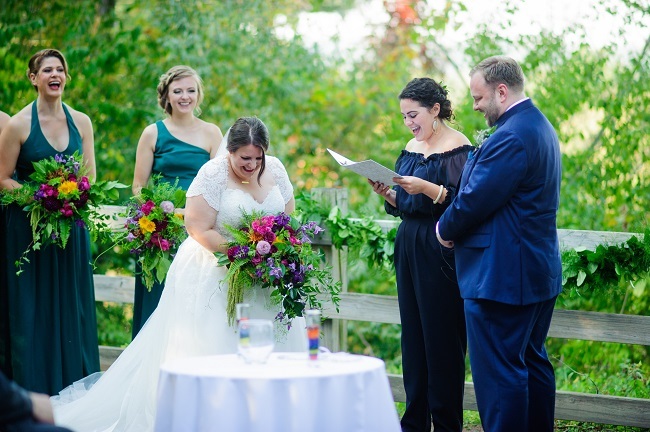 Sara especially loved the process of wedding planning and started a text chain she shared with her bridesmaids (who were all family) so she could share her ideas and they could send her inspiration. 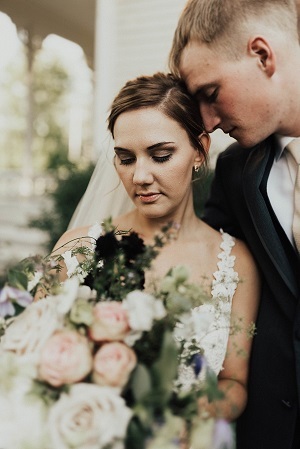 Karl was smart about sharing the things that were important to him and they worked together to find ways to incorporate the designs and ideas they loved into their wedding. 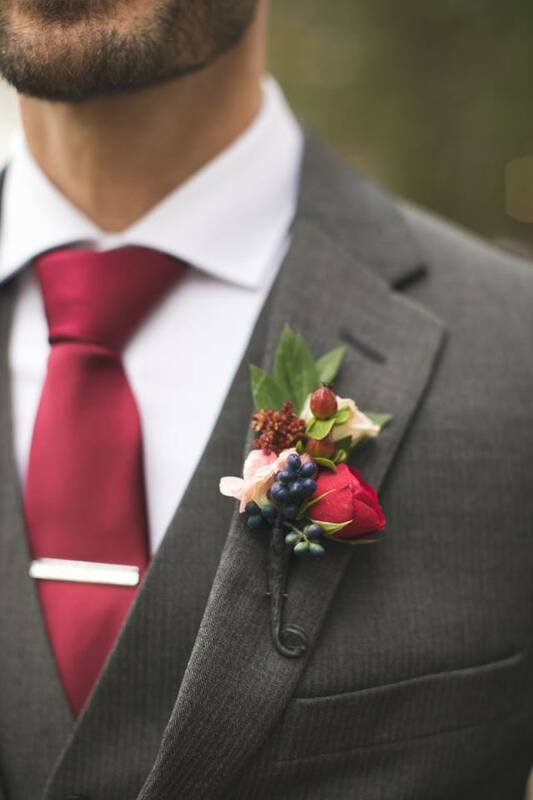 Sara shared her inspiration photos with us and brought us the colorful agates to incorporate into the boutonnieres. 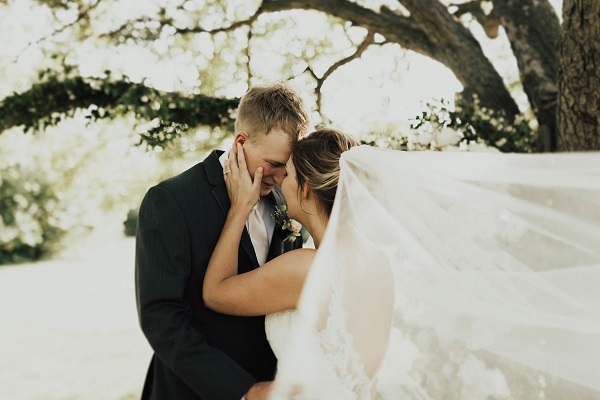 The major hurricanes that hit in the last two months before their wedding made it difficult for her to be fully engaged as she was working 6 days per week (12 hour days) from the disasters. 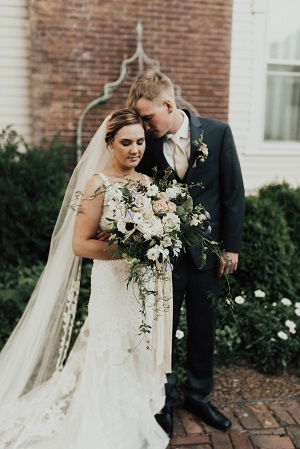 She felt like her head was spinning but Karl took care of some very important last minute wedding planning and close friends helped them create and craft things they had dreamed of doing in the last few weeks. They found themselves crafting at odd hours of the evening and the very rare day off!! 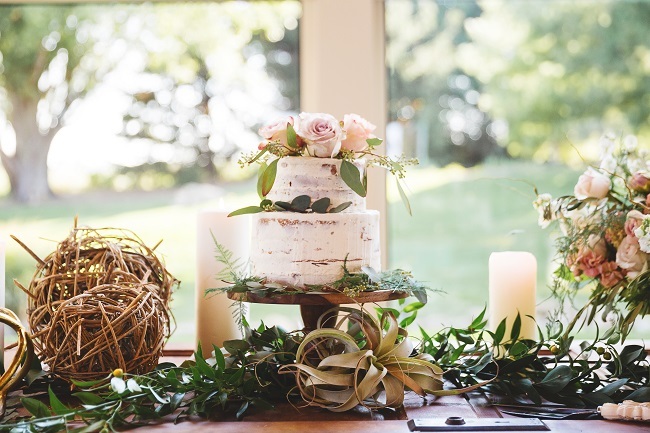 Sara’s wedding planning advice to engaged couples is to – DO YOU!! 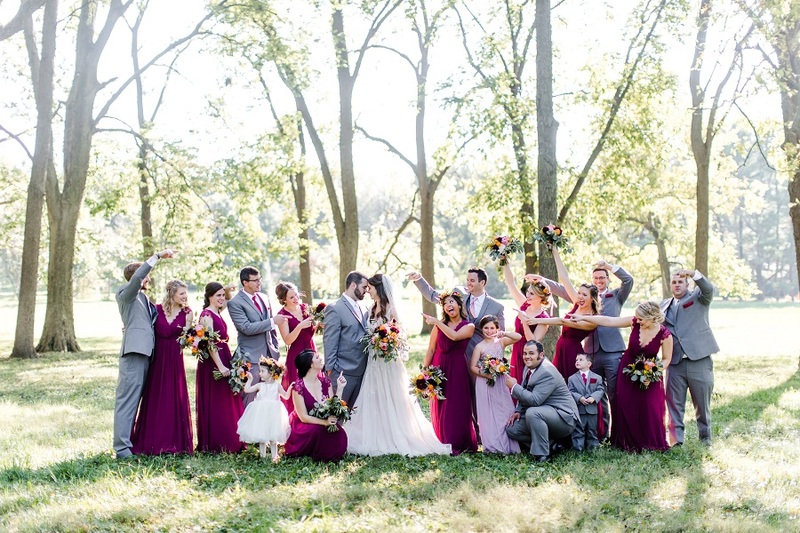 Don’t adjust your wedding to fit everyone else – make it truly personal to you! 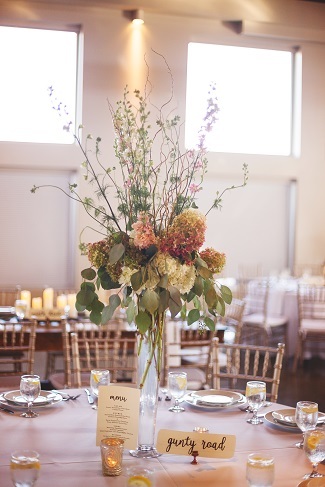 Let us help you make your vision for your wedding flowers a reality! Call, text 309-212-6570 or email at fancyfloralsbynancy@hotmail.com to receive your free consultation. 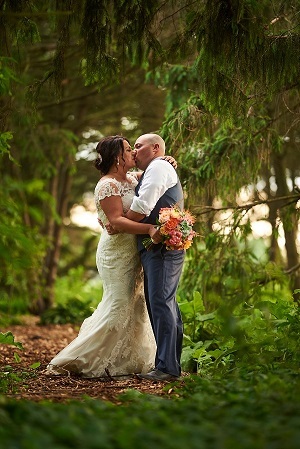 Alex and Nikki’s wedding is one of the most memorable weddings we have done for a multitude of reasons!! 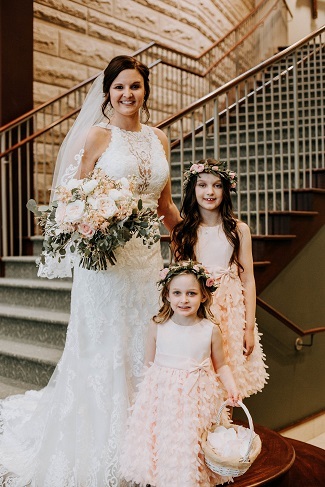 First, this bride says “You can never have too many flowers!” We agree with Nikki and loved creating her gorgeous floral vision. 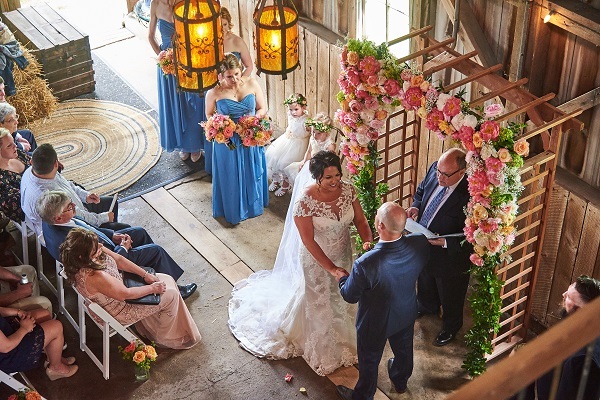 Because of heavy rains in the early morning, the ceremony was moved inside the barn, but the sun came out and they were still able to proceed with the rest of their plans for the day. 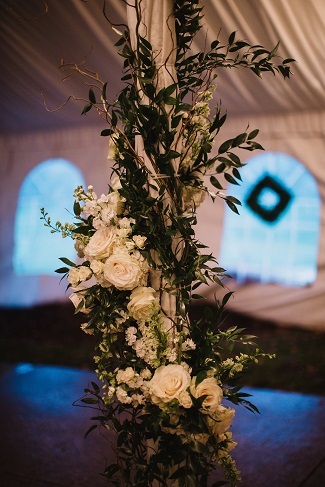 Second, about 2 a.m. in the morning my husband suffered a heart attack and we will never forget how family and friends rallied around us and helped set up the wedding and reception decor. Third, the venue owner had some bizarre expectations even expecting us to place all the table linens for her!! 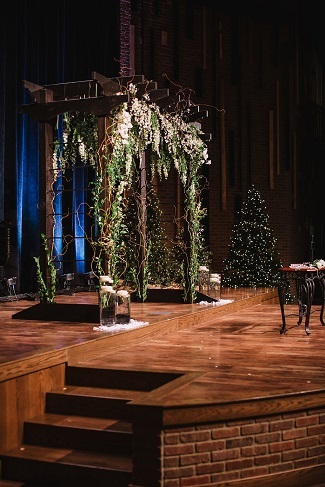 We are so thankful that in spite of the challenges, everything came together beautifully!! 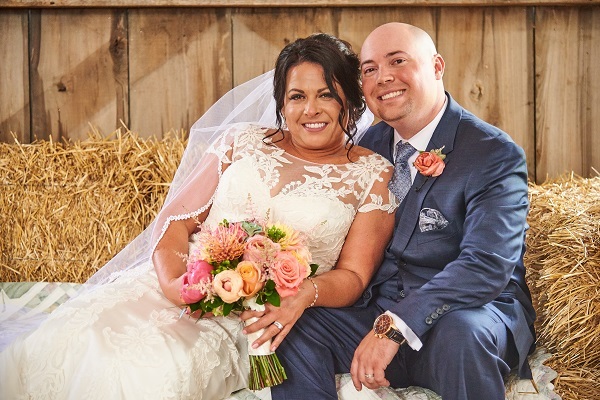 Alex and Nikki celebrated their one year anniversary of being together at Harpole’s Heartland Lodge where they were hiking, fishing and four-wheeling. 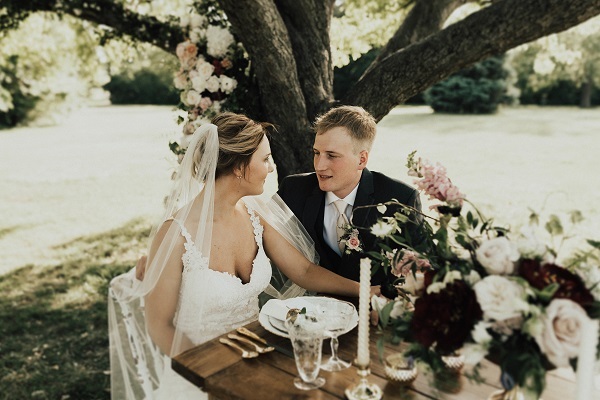 As they stopped back at the lodge for a break, Alex told Nikki he needed to fix something on the four wheeler, but what he really did was create a wonderful surprise for her. He led her to their favorite bluff and as they rounded the corner, there was a basket with a whole picnic spread on a blanket in front of a beautiful lookout. Alex got down on one knee and popped the question! Nikki had no idea and hadn’t suspected a thing!! Nikki was not looking forward to dress shopping as she feared she would end up at dozens of bridal salons searching for the dress that would work for her. As she started looking through plastic bag after plastic bag of white dresses, they seemed to blend together. But after she tried on a few different styles, she started to narrow it down and about 10 dresses in she knew at that instant the dress she had on was it!! She had heard of people having that experience but never believed she would be one of them. 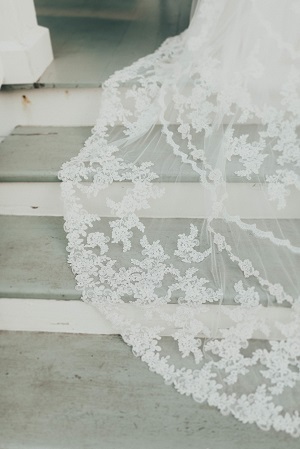 She was able to wear her mother’s veil which was very sentimental for them. Alex and Nikki are both laid back and love the outdoors. 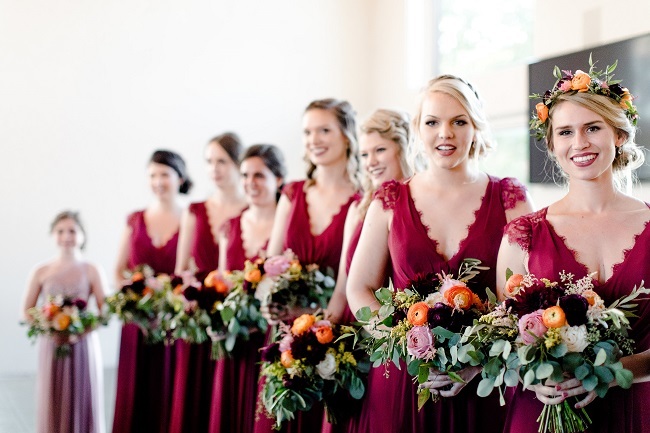 When deciding on the theme/style for their wedding it was important to have a place where all of their family and friends could be there to truly celebrate their union. 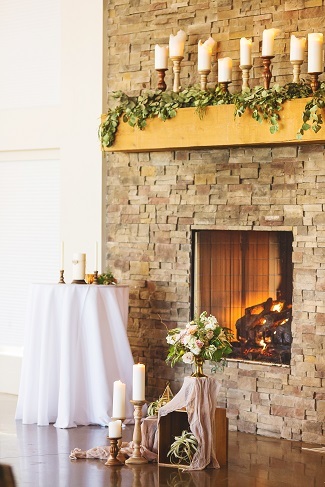 They chose a mix of rustic and classic which suits their personalities. 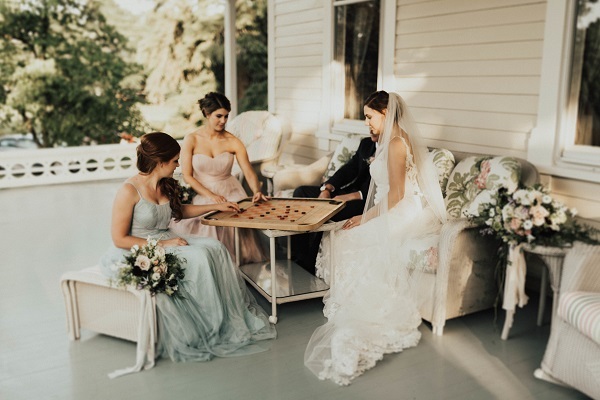 Rain or shine (which it did both on their big day) they were going to have it outside and after the ceremony in the barn, they were able to move everything outside so guests could enjoy the games they had planned. 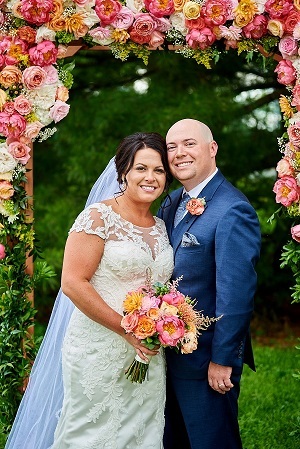 Nikki chose a blend of bright and cheerful blooms for her wedding bouquets and ceremony decor as well as her reception table decor. 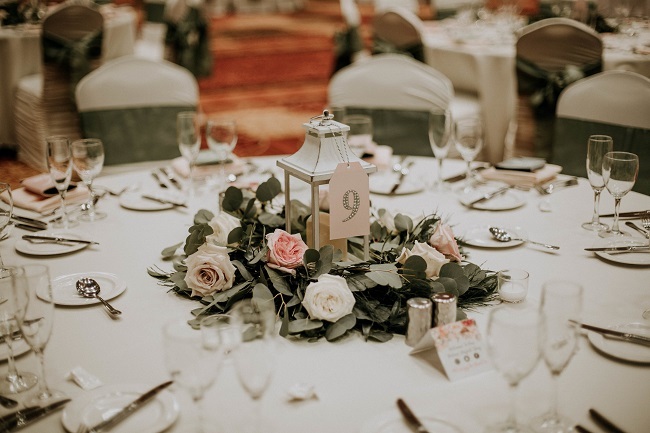 Get advice on vendors and venues from people who have personally used them or know others who have done business with them. She states that reviews can be manipulated online by vendors paying a fee to clear bad reviews which is why she feels it is important to get contact information from former clients of the vendor and reach out to them. 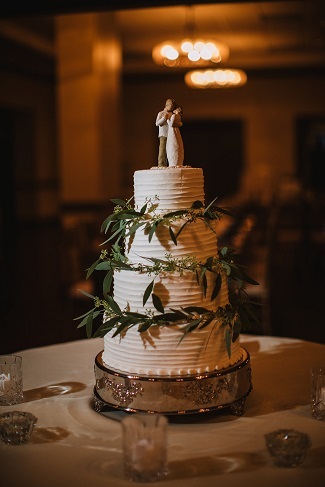 Some of their vendors went above and beyond (caterer and florist), and others were a huge disappointment (unfortunately the venue owners). Looking back Nikki says her biggest regret was thinking she would be able to tie up a few loose ends the morning of her wedding. 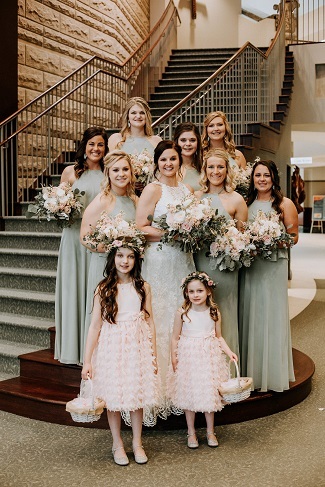 She did end up getting everything done but wasn’t able to relax and celebrate with her bridesmaids the morning of. 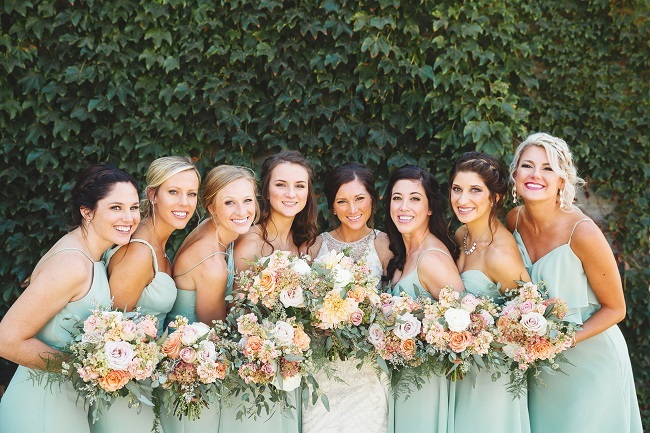 She encourages other brides to make this a priority!! 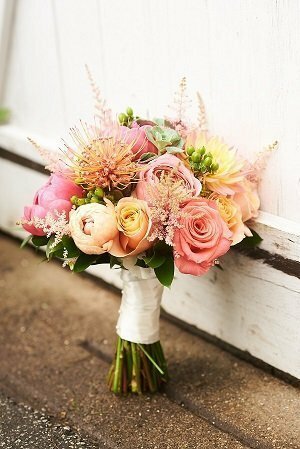 She also stated that you can never have too many flowers. 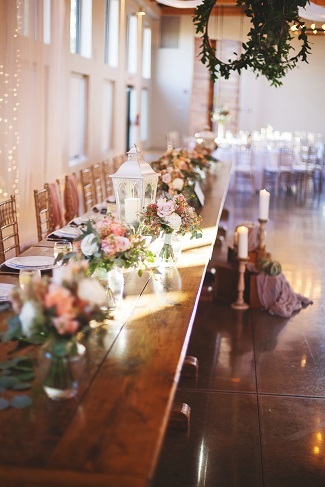 It absolutely made the space feel so special and bridal. 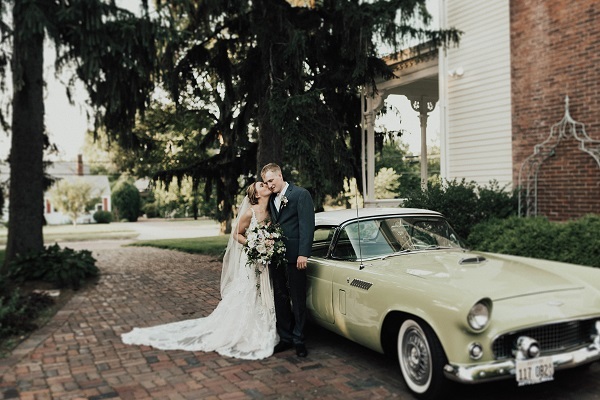 “I gave Nancy my vision with a couple pictures and what she created out of it was more than I could have ever imagined!” Photos by Ernst Jacobson Photgraphy. 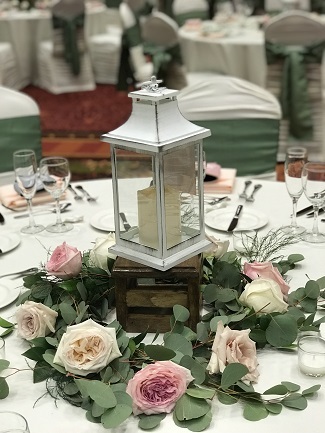 Call, text or email today, 309-212-6570 or fancyfloralsbynancy@hotmail.com , to start planning your floral vision for your wedding. 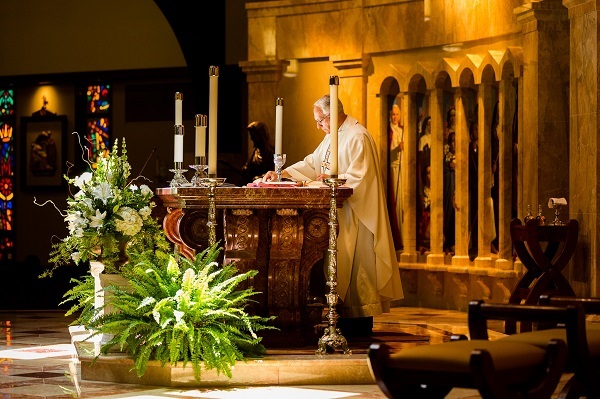 What Makes A Non-Traditional Wedding? 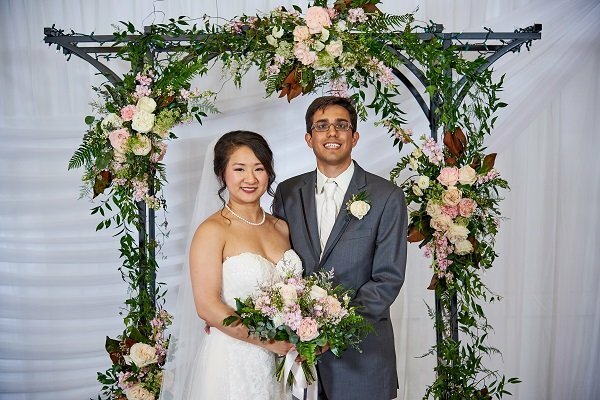 Isthier and Catherine knew from the beginning that their wedding would be non-traditional as they planned to combine some Chinese and Bengali wedding customs during their ceremony. 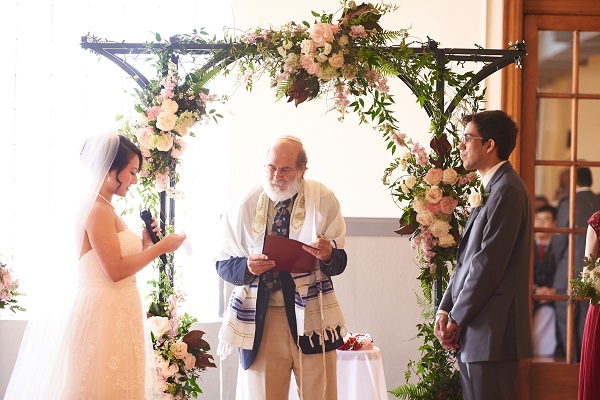 As Catherine explained they wouldn’t have it any other way as she had a bride’s man and Isthier had a best lady, as well as the fact that neither of them are religious yet their ceremony was performed by a rabbi who along with his wife are close friends of theirs. 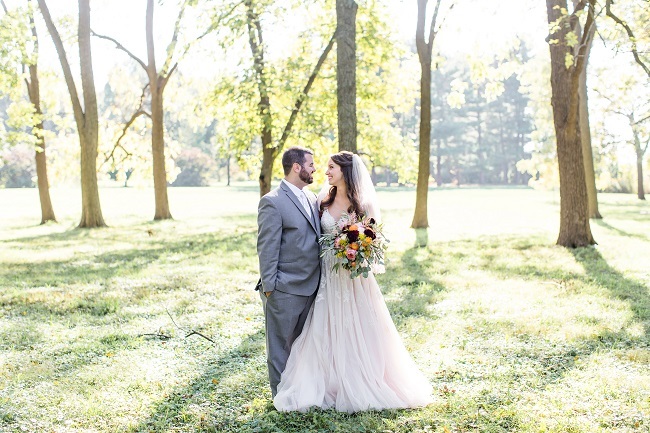 On the day that Isthier proposed, they had planned on taking a trip to St. Louis Arboretum. It’s a funny story now, but at the time Catherine was a little irritated that morning as they had to get up early and he asked her to change what she had on to something a little more fancy! He found a quiet spot in the Japanese Garden as he knew she didn’t like attention focused on her. She was so surprised and overwhelmed she doesn’t remember what exactly he said!! 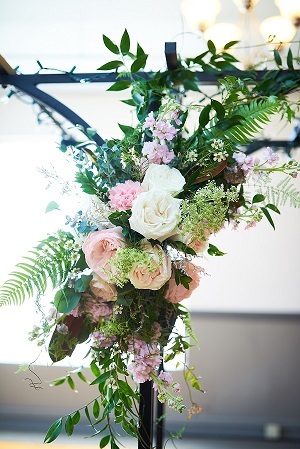 Catherine settled on a soft pink palette for her wedding flowers. She felt that white was too stark and bright colored flowers would be distracting in photos so she wanted to keep her floral vision soft. 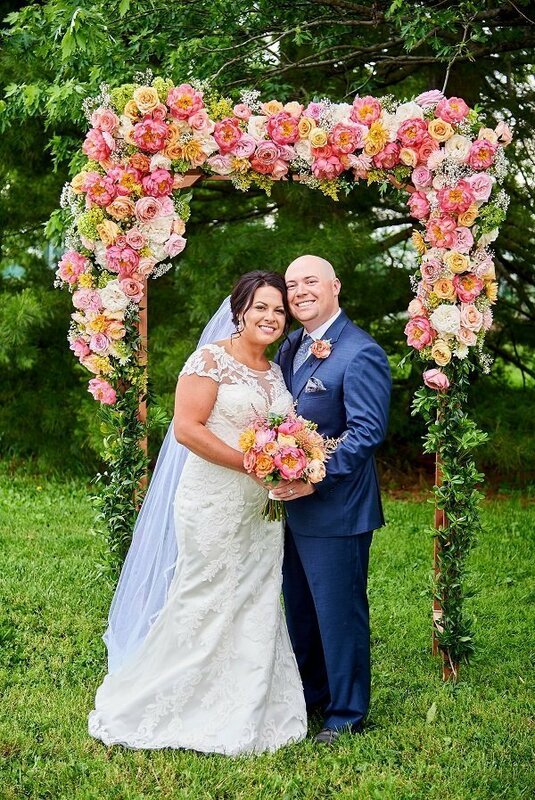 We used a combination of pastel garden roses along with stock and mixed greens for her bridal bouquet and wedding arbor backdrop. 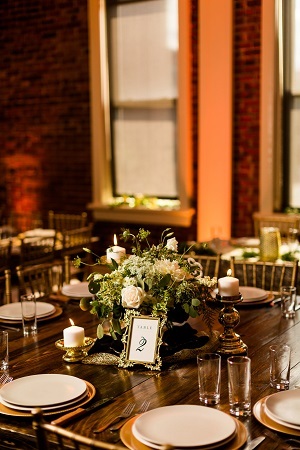 The biggest challenge of wedding planning for them was simply getting started and finding a venue. Originally they wanted to get married in Chicago. 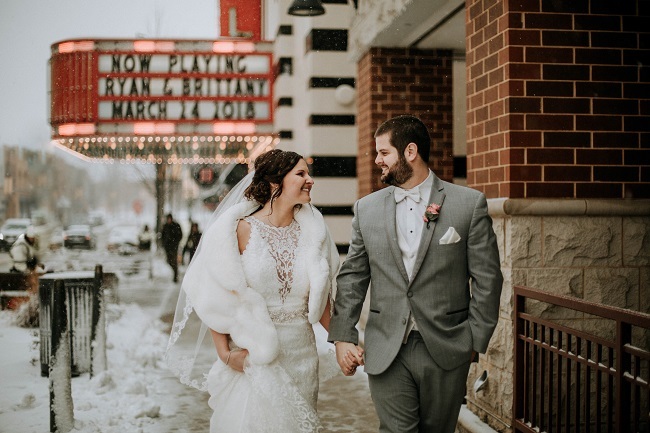 After realizing how much more expensive that would be as well as inconvenient (as they are located in Champaign) they found the Walton Center on a wedding website and liked the character of the charming old building with the arches and large ballroom. 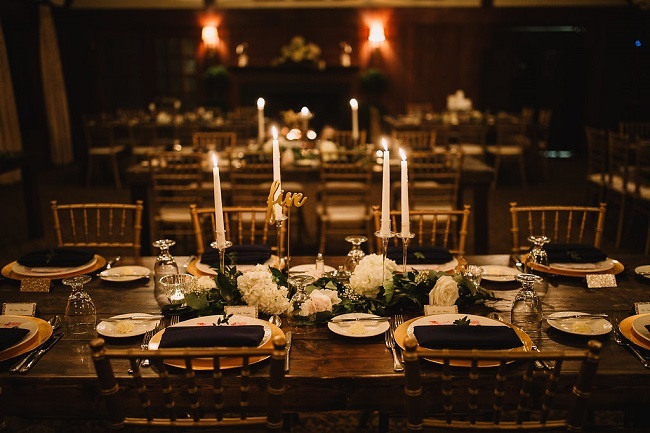 Once they had their venue booked, everything started falling in place. 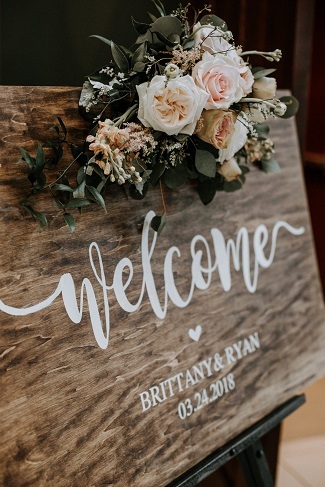 For their wedding decor, they tried to focus on having unique aspects. Because she enjoys bargain hunting and re-purposing things, they had fun finding small animal figurines which they spray painted gold to enhance the floral decor. 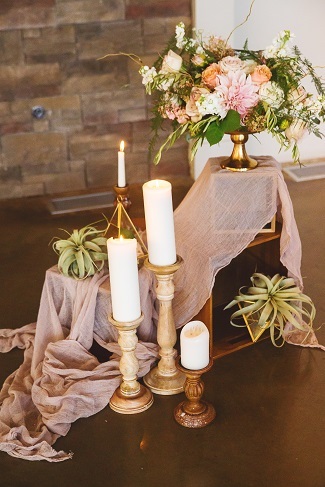 She offers this tip for brides, “Spray paint makes anything look amazing! 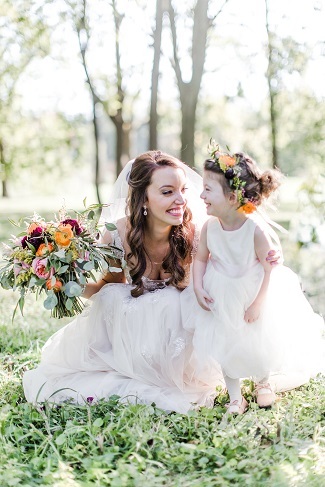 !” This turned out to be her favorite part of wedding planning. 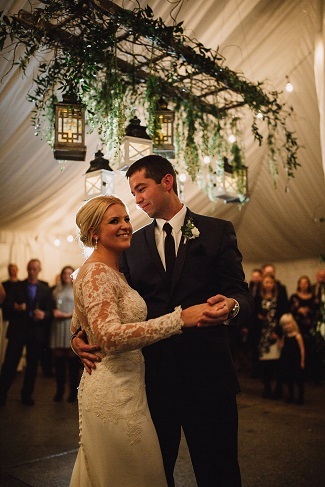 Among their favorite memories from their wedding day were dancing and seeing friends. They both swing dance and their first dance was “Come Fly With Me” by Frank Sinatra. 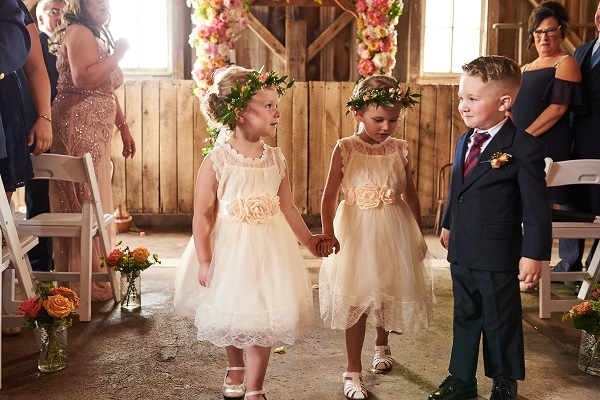 Two of her best friends finally met each other at the wedding. They had been blogging pen pals in college but had never met. When Catherine posted on Facebook about her new job, her childhood friend Stephanie realized that her college pen pal Sue worked there also and that helped break the ice between Sue and Catherine. 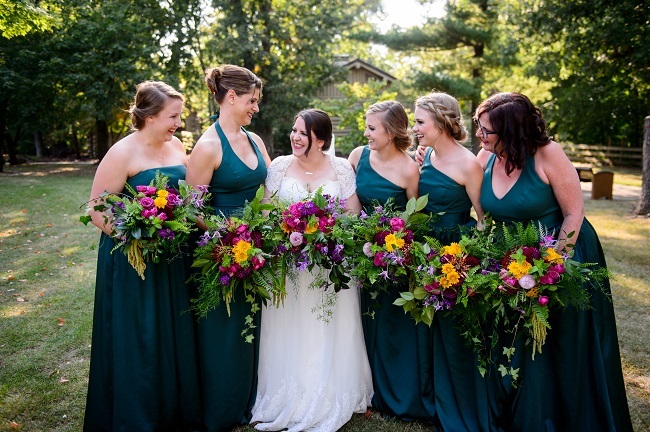 They became such good friends that Sue was one of her bridesmaids. It was a pretty awesome moment for Stephanie and Sue to finally meet!! Where Do Today’s Brides Get Wedding Inspiration? 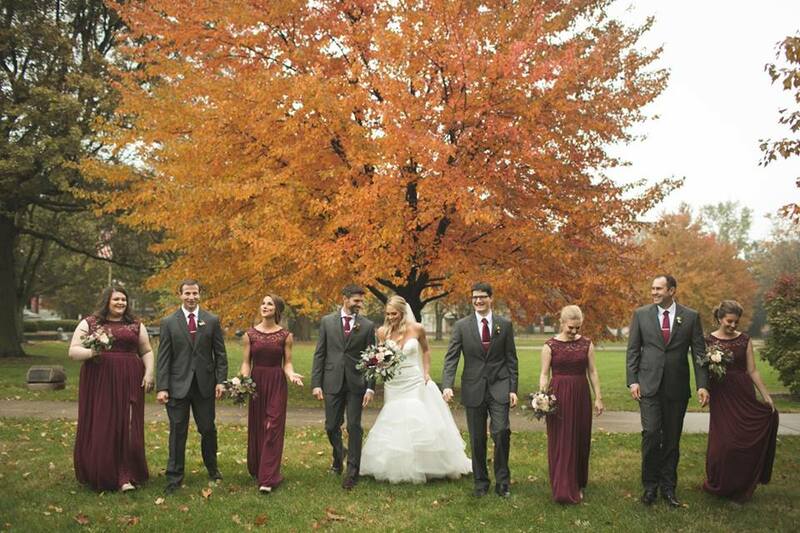 Lauren and David met while students at Illinois State University in 2010 and were introduced by mutual friends. 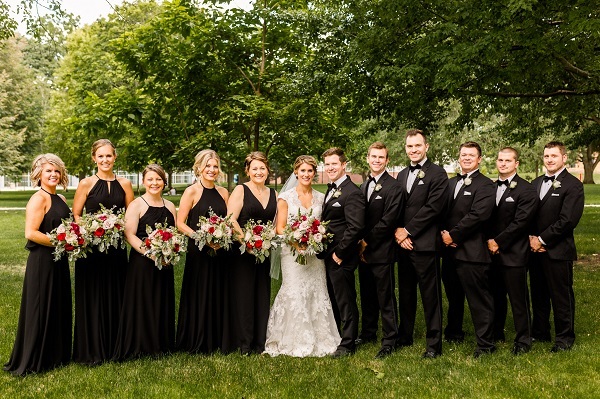 Lauren had decided on the classic all-white color palette for her wedding flowers to create an elegant feel and contrast with the black tuxes and black bridesmaid dresses for their July 1st wedding date. 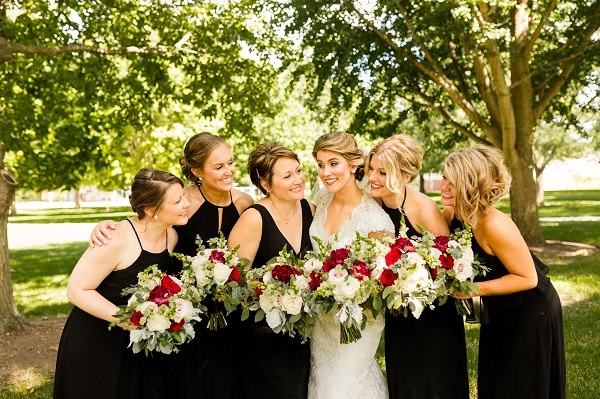 Because the wedding took place just days before 4th of July, she later decided to add a pop of dark red with blush to the bridal bouquets and looking back over these gorgeous wedding photos by Caitlin and Luke Photography, we are glad she did!! 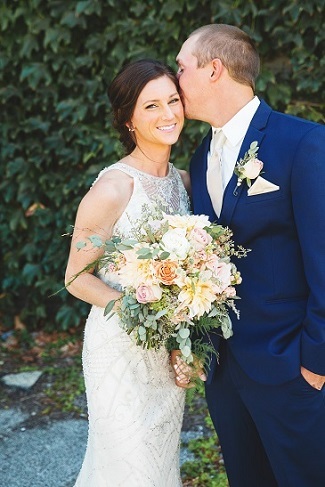 Lauren’s most enjoyable part of wedding planning was being able to cross things off her list for that meant she was getting closer and closer to her wedding day!! She explained that finding herself very detail oriented, it took her a long time to make decisions as she wanted to ensure everything complimented her overall vision. 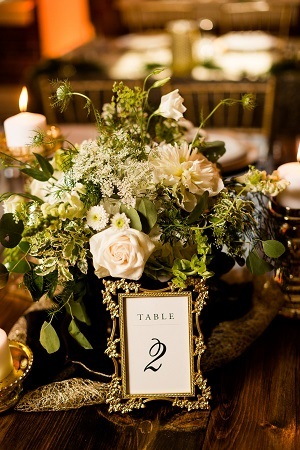 She stayed with the all-white flower color scheme for her reception centerpiece decor and brought in gold accents with vintage style accessories such as the table number frames, candle holders and gold & black fabric under the centerpieces which she rented from Old Oaks Vintage Rentals. 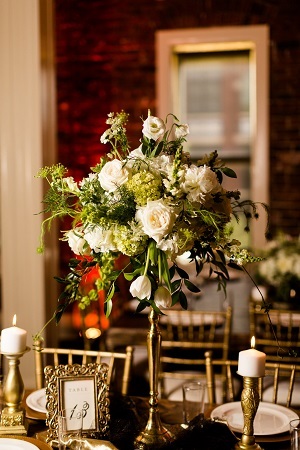 A third of the centerpieces were lush mixed greens & white blooms in our gold compote vases. 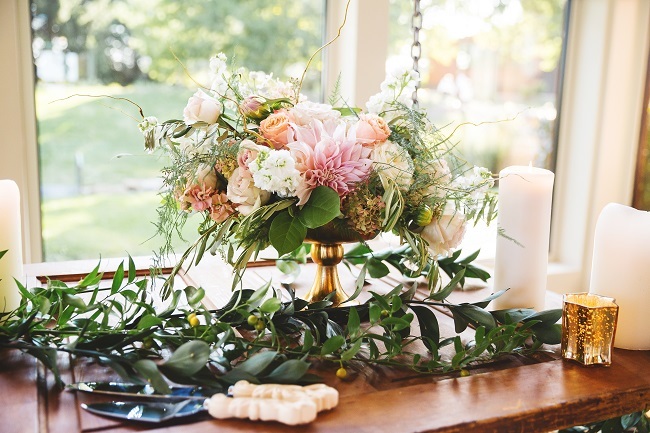 Another third of the table centerpieces were created again with lush mixed greens and a mix of white hydrangea, peonies, roses, tulips, snapdragons, astrantia and button mums on our elevated antique gold stands. 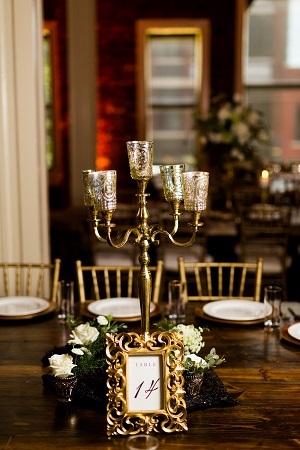 The final third of the tables held our antique gold candelabras with mercury votive holders and four matching votive filled with mini white bouquets scattered under the candelabras. 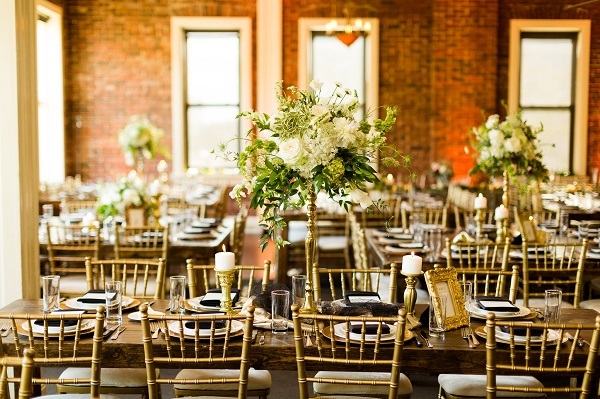 The harvest tables and gold chiavari chairs rented from Palace Events completed the magic scene against the charming warm brick walls of Epiphany Farms and Anju Above Restaurant. 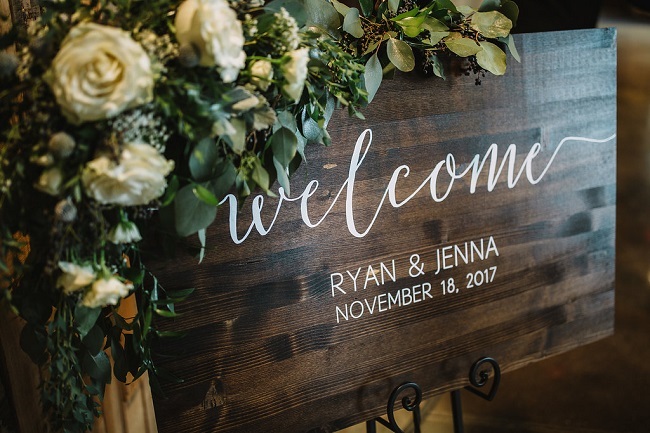 David and Lauren found the key to overcoming wedding planning challenges was “compromise!” Their biggest challenges stemmed from deciding on a budget and other major decisions such as the location of the venue and crafting the guest list. Like all couples they had some different wants and opinions and being able to be flexible and compromise with each other is such a valuable start for a successful, happy marriage!! 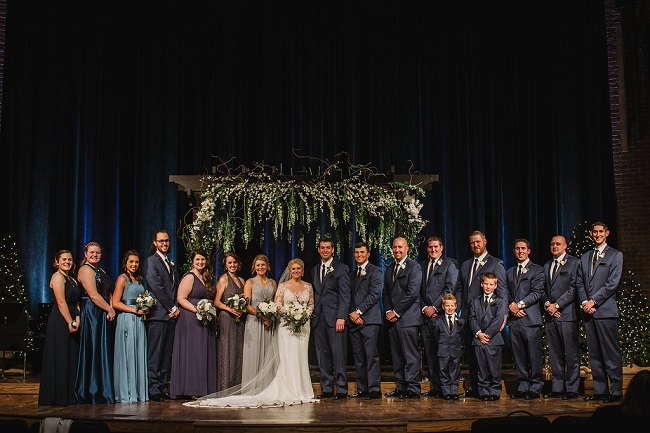 We were honored to be a vendor in this beautiful wedding and offer our sincere congratulations to this couple!! 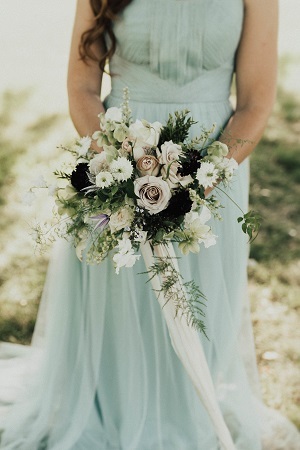 This vintage styled photo shoot was born from my desire to do some re-branding for our wedding floral business. 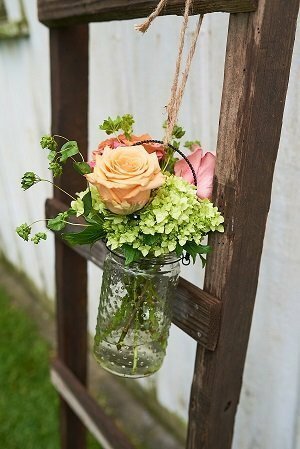 I think because I have been a gardener for so long I am drawn to the natural, lush garden style bouquets that are becoming so popular. A styled-shoot was a good way to try out this vision, get some photos as well as work on getting published. I didn’t need to look far for a photographer as I had worked with Lauren on a shoot last fall and knew first hand what a talented photographer she is. 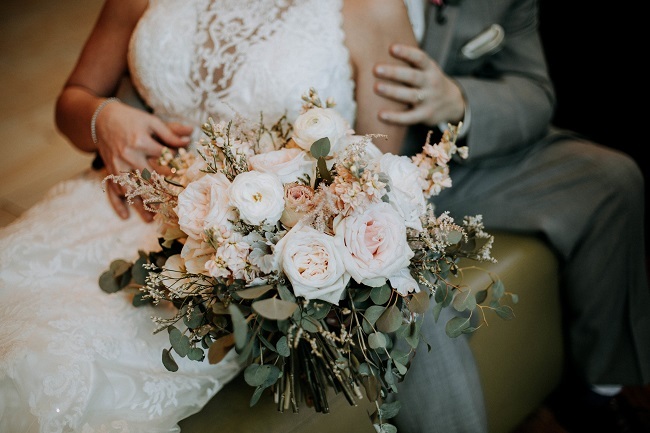 Because both Adore Bridal Specialty and Spruce Wedding Rentals (formerly Something old Event Rentals) had agreed to partner with us we realized the shoot would best take place close to the Washington/Morton area. 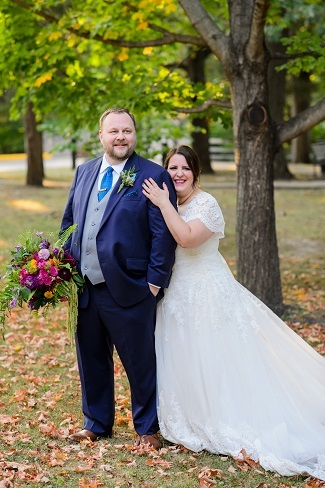 As we scouted around, we were delighted with what we found – in a Washington park this arching branched tree to decorate as a backdrop and the Danforth House with it’s lovely large porch which we initially chose as a rain back-up plan. 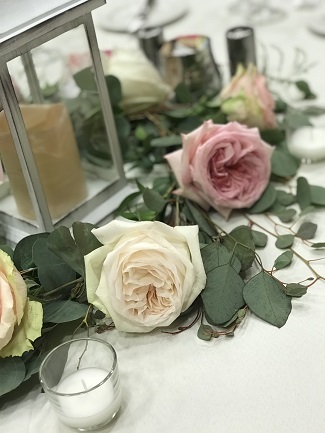 The vision for the wedding flowers was pastel, romantic blooms like Quicksand, White O’hara and Upper Secret roses with soft green helleborus to create a soft blend of color. 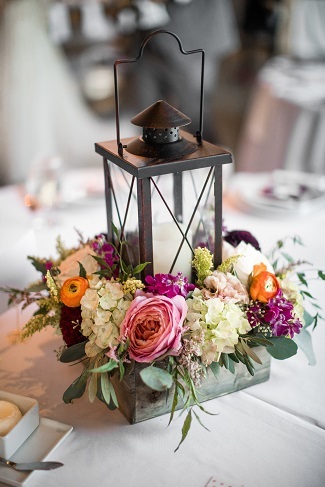 We added some contrasting darker blooms like black scabiosa, burgundy peonies and blue clematis tucked in for depth and a touch of mystery. 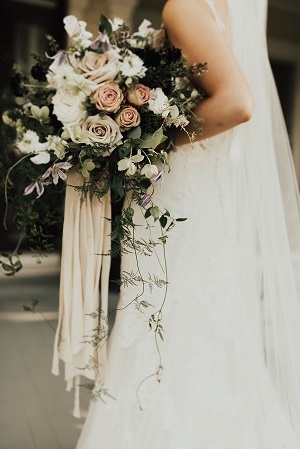 Ferny white nigella added great texture and the addition of white sweet peas and cascading green foliage finished it into a lush garden style bouquet. 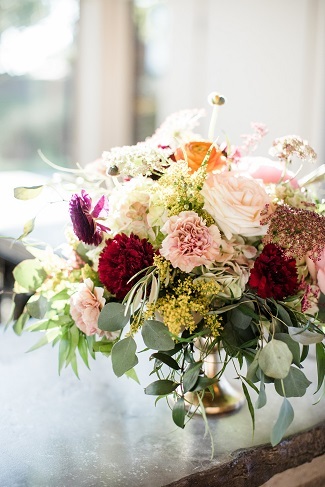 Mixing these luscious blooms together was like putting together ingredients for a yummy desert!! 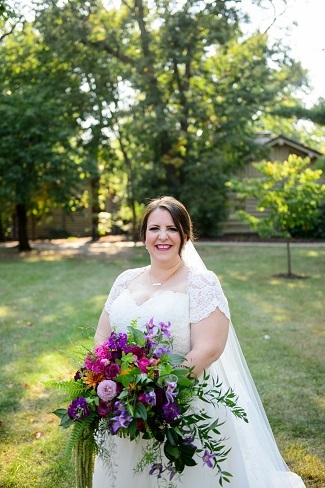 Andrea from Adore Bridal was so nice and helpful. 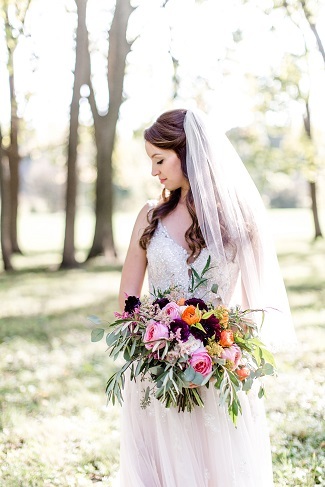 We sent her our inspiration board and described the vintage feel we wanted for our shoot. 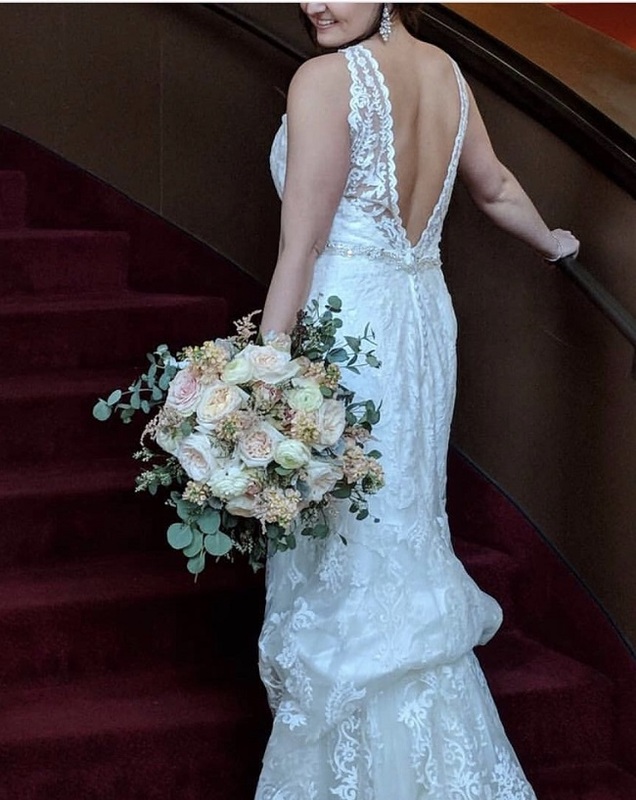 We fell in love with the first gown she brought out for us to view! Altar Ego Spalon did the girls hair and make-up for a beautiful effect. 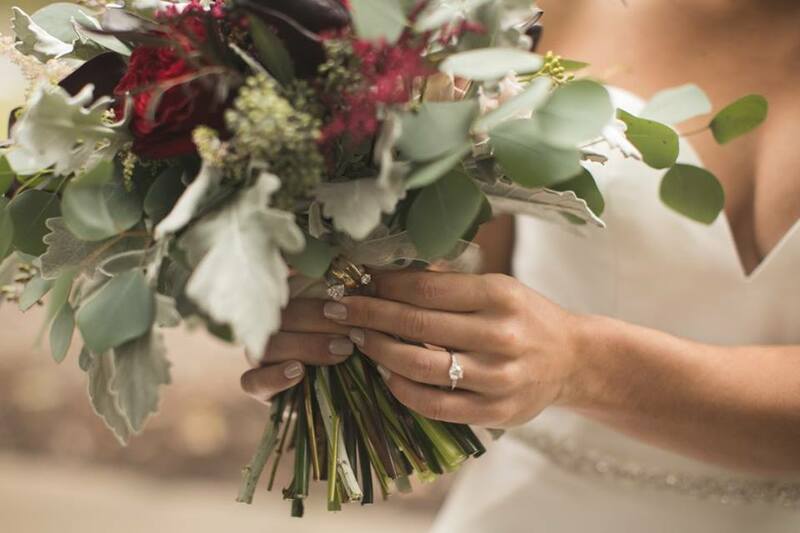 Lauren had a great experience with Bremer Jewelry and Spruce Wedding Rentals from her last photo shoot so we were happy they partnered with us again. 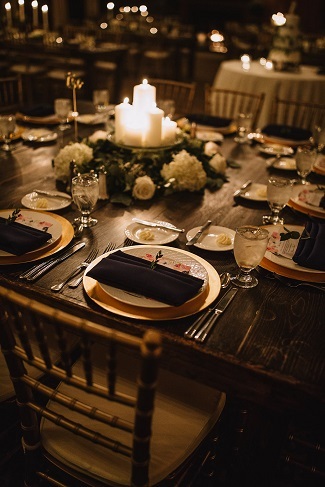 The table and mismatched chairs are part of Spruce Wedding Rentals extensive collection. 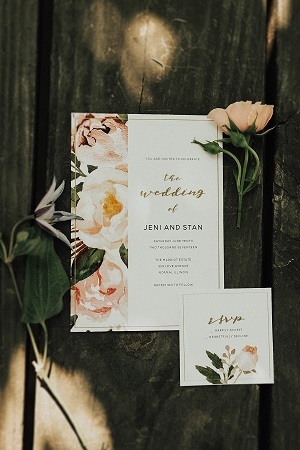 East To West Studio custom created this lovely one-of-a-kind stationary just for us. Thank you so much to our models who endured the 90 degree heat and did such a great job! Our bride and groom Jeni & Stan got to practice for their real wedding which will happen in September. 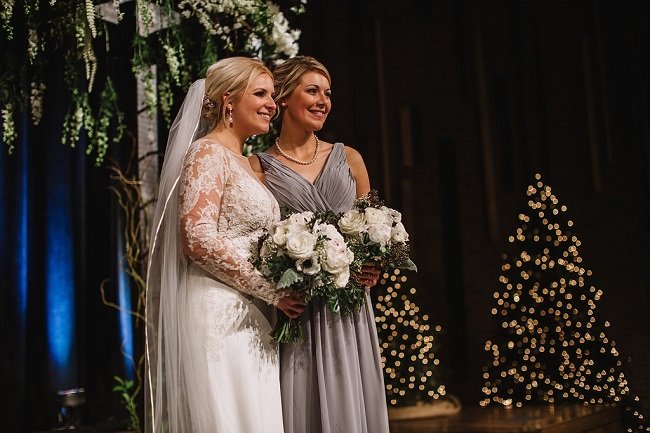 Emily (blue gown) got married on New Years Eve last year and Lauren (mauve gown) took time from her own wedding planning to help. She was married just a few weeks after the photo shoot. All of the models are/were our future/past clients. 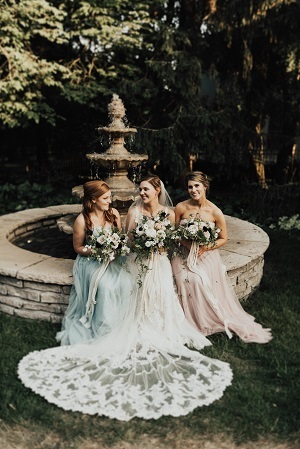 The blue and mauve bridesmaid gowns caught our eye in the window of Adore Bridal and were exactly the soft colors and filmy fabric we had envisioned for our vintage, romantic styled shoot. 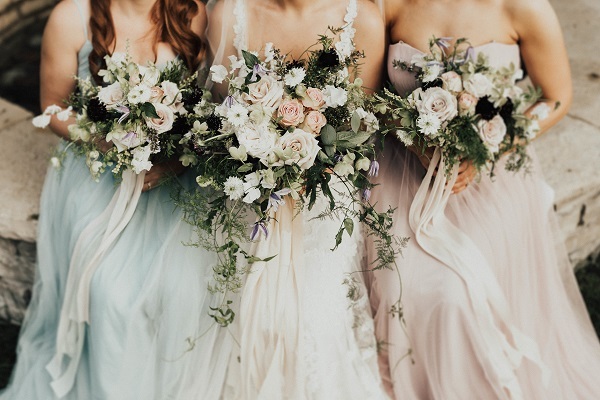 The bridal bouquets photographed beautifully against these gorgeous gowns and they went perfectly with flowing hand-dyed silk ribbons adorning the bridal bouquets. 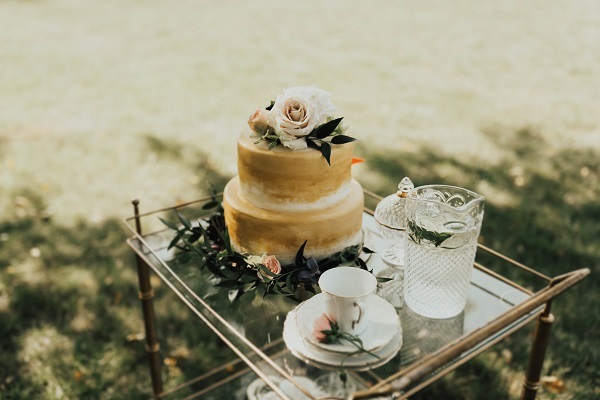 Tessa Herr of Bojeannies created this beautiful gilded wedding cake and the gold bar cart from Spruce Wedding Rentals was perfect to display and serve from. 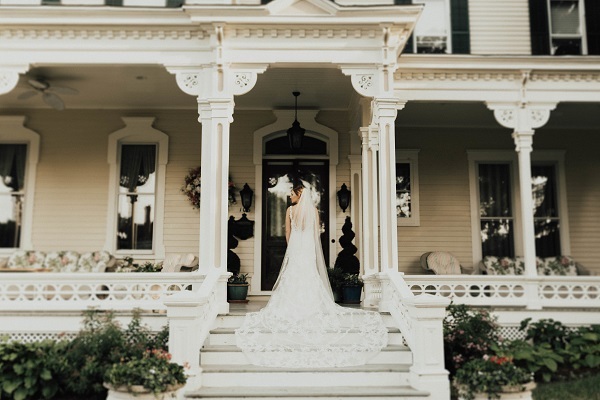 We had a beautiful rain-free day for our photo shoot and didn’t really need our rain back-up plan, but who could pass up the opportunity to take photos at the beautiful Danforth House which the Martin’s so graciously extended to us . 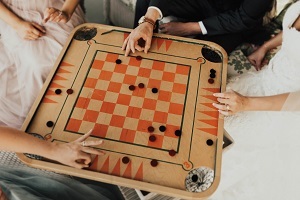 The porch and wicker furniture also made the perfect backdrop to photograph the vintage carrom board game. Doesn’t this look enticing to have time to sit on this beautiful porch and play games – so reminiscent of simpler times. 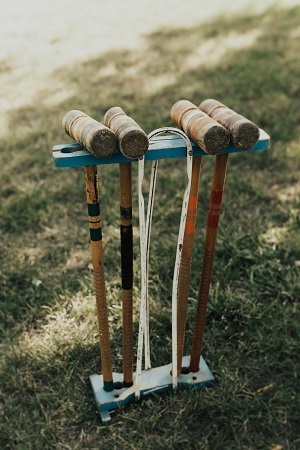 The carrom board was my grandmother’s and the vintage croquet set as well as the vintage glassware was handed down from my husband’s family. It was a great opportunity to pull these old items out of storage and put them to use! 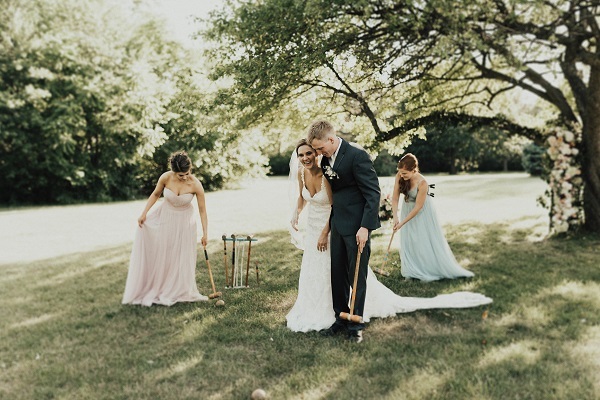 Who can resist a game of croquet on the lawn?? 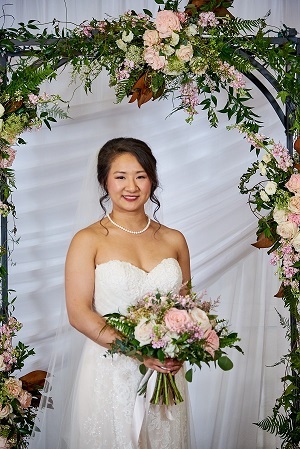 Every side of the Danforth House had another pleasant surprise and photo opportunity to photograph the models with their bridal bouquets. The grande finale came when Mr. Martin offered to start up one of his vintage cars and bring it around for a fantastic get-away-car photo!! How could it get any better? It was like the icing on the cake!! The whole evening was a magical experience for us and we had great fun. Thanks again to our vendor team, models, and our support helpers, Kendra & Laine Fehr and Betsy Zimmerman – everyone did such a great job! !